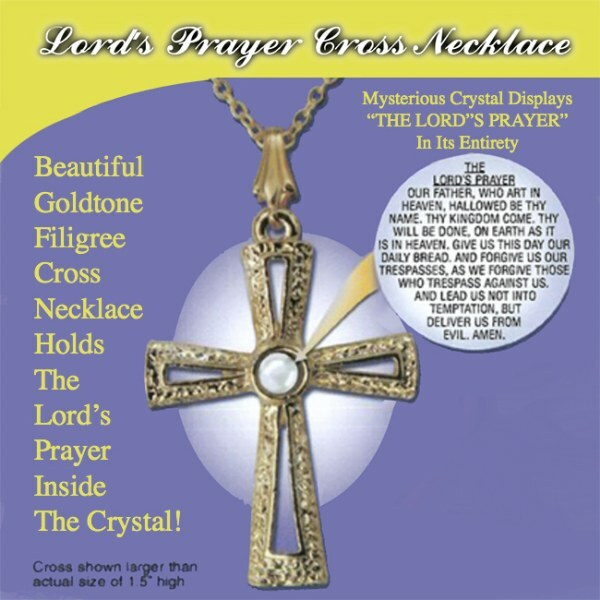 Read the Lords prayer through the center crystal of this beautiful pendant necklace. The Lords Prayer Cross Pendant Necklace Give the timeless gift of prayer with the Lord&apos;s Prayer Cross Necklace. This elegant classic is a stunning example of fine craftsmanship in crystal jewelry. When held to the light, it miraculously displays the Lord&apos;s Prayer inscribed onto a specially designed center crystal. This one of a kind spiritual accessory is the perfect gift for any age, a beautiful piece of jewelry for men, women, and children to always keep the Lords prayer close to their heart.